jazzfest | art by mags! i love jazzfest time! i only get to go one day each weekend this year, and today was my day this first weekend. it was so lovely out there! overcast and windy helped balance out the warm and muggy. and no rain! hope that holds for folks throughout the rest of fest. i ate way too much amazing food, saw some incredible art and craft, and heard all kinds of great music while hanging out with dear friends. it was perfect. 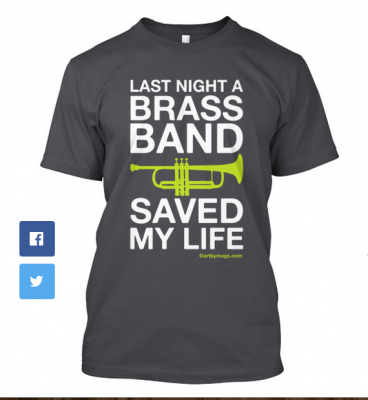 today i wore my LAST NIGHT A BRASS BAND SAVED MY LIFE shirt out to fest and got stopped a ton by folks diggin on the design, taking pics of it. so for any of you who may have followed my website address that’s cleverly added to that design on the shirt, i just wanted to thank you for your interest and help navigate you to where you can order both t-shirts and stickers of the design. t-shirts can be found here, on teespring. (and tanks can be found here.) lots of sizes and styles and a few color choices too, so check both links cuz they are two separate listings with lots of different options. and stickers can be found here, in my etsy shop. enjoy the rest of your jazzfest! so my patreon subscribers will get a handful of these free this month. the rest of you however will have to chip in a little for one, so i can start raising the money for the next sticker i will make next month – my “less internet, more art!” design that i stenciled on a few signs years ago and then never did anything else with. what with my 2016 push to get back to my art and creativity, seems like that slogan is a logical one to put out there in the world and put in front of myself to remind me to focus and not get distracted. this batch of stickers cost me $113 for 200 of them (via stickermule), roughly 57 cents each. so i am asking $1 a sticker if you get them from me in person, cash. if i have to mail them to you or you have to pay me via electronic means, they will be $2/each or 3 for $5 or 6 for $10, to cover the stamp, envelope, electronic payment fees, and/or tax. 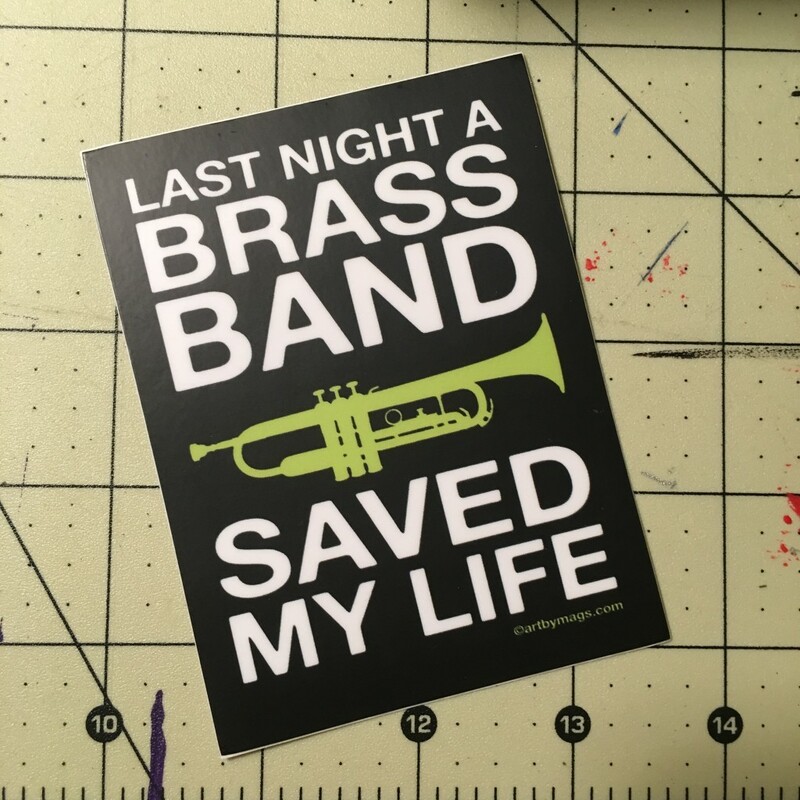 these stickers are 3″ x 4″ so big enough to put on a car bumper but also small enough for scooters, bikes, computers, and other applications. JUST MAKE SURE I HAVE YOUR CURRENT ADDRESS TO MAIL THEM TO YOU. sometimes folks don’t update their address via paypal and then i end up sending stuff to the wrong place. and squarecash doesn’t have your address on file so you have to send it to me. best to jot me a quick email at: mags@artbymags.com and tell me what you’ve ordered. thanks!